"In 100 words, describe your favourite ancestor." BUELL (BUEL), William 1610- 23 Nov 1681, from England to Plymouth in about 1630 in one of two boats led by Rev. John Warham. William settled in Dorchester MA, owning land by 1636. Dorchester was renamed Windsor by 1637. William married Mary POST 18 Nov 1640 in Windsor CT where they brought up their 7 children (5 girls, 2 boys). Mary's parents were lost in the 2nd boat, by the way - I'm not certain who would have been raising her. William was apparently a cabinet maker/carpenter. My ancestor is their eldest child, Samuel William BUELL. I have found the Albert Welles' book of the History of the Buell Family in America full of misinformation and incorrect assumptions, making for some definite challenges in early research. Here's another book I've also used, and there are more of course on early history of Windsor. A quick search on Google will turn up a number of books, booklets, histories and more. Wikipedia has a lovely 1640 map of Windsor, showing Wm Buell's land (top half, left of centre). Don't you love these wonderful old maps -?! My father's surname was GILLESPIE, and I knew very little about his parents' ancestors when I started trying to research our family tree about 8 years ago. All direct grandparents and parents were deceased by then, and I wasn't very close to my much-older first cousins on that side. Dad was born in Cambusnethan, Lanarkshire, Scotland on Sunday April 7, 1907, coming over to Canada with his Mom and 4 siblings in November 1914, following his father who had arrived in Canada in 1911. Thank heavens for passenger lists with all their details! remember both his parents having an accent of some sort - maybe it was Scottish, or English - I wasn't even sure! My Dad was nicknamed "Scottie" when he was younger because of his accent - which disappeared in his teens. My grandparents never talked about the old country that I remember. I assumed we were Scottish, because of his birthplace, and the tossed-off comment that his older siblings remembered playing on Hadrian's Wall. But I also knew they lived in Barrow in Furness, Lancashire, England, before coming to Canada. Hmmmm. Odd that we never questioned them - or maybe it isn't very odd at all. Children are rather narcissistic by nature and development, so by the time I thought to ask questions, my grandparents and their older children were deceased. Research now shows that my grandfather GILLESPIE - Jack (William John) - was born in Augher, County Tyrone, Ireland, 23 August 1876. And I have the birth registration to prove it, showing his father, his mother and her maiden name (ARMSTRONG), the village, and the belated registration of his name in October 1876. Yeah!! And the person "present at the birth" had the same surname as Grandpa's mother's maiden name: a Margerie Armstrong, living in the same village of Augher. Possibly her mother? A sister? Aunt? Clues galore! Grandpa's younger brother, Jim (James Robert), was born a few miles further north in Omagh, County Tyrone, Ireland. Page-by-page-turns through a Family History film found me his birth registration, with same parents' names. Excellent confirmation. 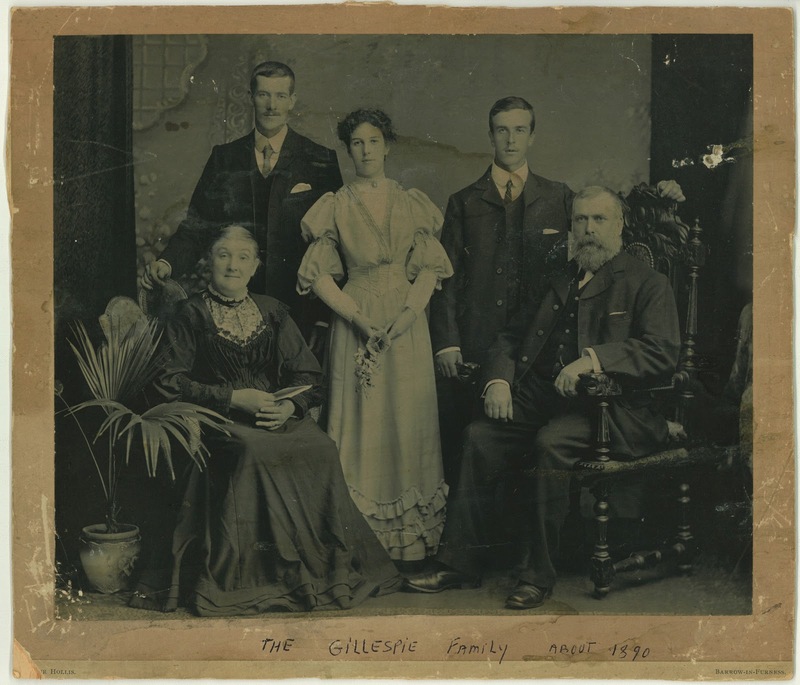 The entire family - Grandpa, his brother Jim, his parents, and his grandparents with aunt and uncles - all moved from Ireland to Barrow in Furness between 1879-1881, as they are all listed on the England Census 1881. A few years ago, I finally reached out to a few of my elderly first cousins on my dad's side. He was the 2nd youngest in the family, and his elder siblings were already married and with teenaged children when he finally got married in 1941. Our first cousins ranged from 15-25 or more years older than us, the youngest grandchildren. June had a lovely large photograph of my Grandpa's siblings and parents, in the mid-1890s (incorrectly labelled as 1890). Grandpa is the young man on the left. What a glorious find! I have also had wonderful conversations with another cousin, Catherine, who is now 87 years old, about our mutual grandparents and stories she remembers. Now I'm searching diligently through Northern Ireland records, and maintaining a relationship with Catherine, enjoying reminiscing with her, teasing out more possible clues to follow, and enjoying her stories. She has photographs my parents didn't - which I've scanned, and is also able to give me relatives' names in England, early history of our grandparents in Canada, explanations, and more! If you have more information on our GILLESPIE-ARMSTRONG family, do please contact me at calewis at telus dot net and I'll be happy to correspond. Or, leave a comment below. Cousins? Any cousins out there? Check the list of children #3... perhaps they are your family! I'm attempting to fill in the great-grand aunts and uncles of my GILLESPIE father's side, in hopes of finding a few cousins who may have stories or photographs or more to share! Note that capitalized surnames are my direct line ancestors. My GreatGrand-Aunt Margaret Gillespie is still quite unknown to me. Her husband Joseph Smith shows up in 1882 for the first time, marrying her in Barrow in Furness, Lancashire, England. This is where the 3 generations of the Gillespie family settled just before 1881, and where Margaret and her husband Joseph raised their 9 children. The family disappears before the 1911 Census. 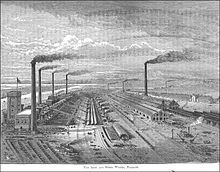 In Barrow in Furness, shipbuilding and steel work were the big industries in the mid to late 1800s, but became less so in the early 1900s. Families needed to be able to move to where employment could be found in steel work, ship work, etc. For example, my grandfather moved his family up to Newmains Scotland for a few years in the early 1900s, and two of his uncles (Andrew and Robert) moved back to Ireland settling in Belfast around the same time. Joseph Smith was working as a "Shipyard Labourer" on the 1891 Census for Barrow in Furness. And on the 1901 Census, his occupation is listed as "Fireman Shipyard." Unfortunately I have not been able to track down these children by marriage or residence, mainly because of the Smith surname and relatively common first names. Note that James & Elizabeth Gillespie, and George & Catherine Gillespie died in Barrow in Furness (often listed as Barrow), Lancashire. However, Andrew Gillespie and brother Robert & Mary Jane Gillespie moved to Belfast area, and died in Northern Ireland. If any of these are your relatives, do please contact me at calewis at telus dot net -- I'm happy to share whatever I do have with you, and work with you to find more details as well.